The idea of having August Burns Red and Between the Buried and Me co-headline a tour together seems odd at first. Between the Buried and Me is a progressive technical death metal band and August Burns Red is an energetic metalcore band. I couldn’t have been further from the truth. The show got off to an early start at 6:30 PM, with openers Good Tiger fighting an uphill battle. Not only did the show have an early start, the venue was less than half full. The band stepped up in a big way, delivering what can be best described Coheed and Cambria, with a dash of Between the Buried and Me along with a helping of groove based rock. Come to think of it that would make for a pretty amazing evening of music. They delivered a solid set and everyone who arrived early were treated to a good start to an amazing evening of music. Between the Buried and Me is a band that if you like them, you probably love them. Their music goes from haunting keyboard, to mind boggling progressive rock and then gut you with some of the best death metal ever played. All of those aspects of their music were on display last night, starting the set off with “Foam Born (A) The Backtrack”, which begins with singer Tommy Giles playing piano and singing alone, then gets spacey and finally melts the audience’s faces with a guttural scream. From there the band was unrelenting, pummeling the audience with “(B) The Decade of Statues” and “Telos” and “Shevanel Cut a Flip”, from their self-titled debut. The set played almost as if the band was trying to take the audience backwards to their beginning and then say ‘This is where we are now’, because they went into probably one of their more adventurous songs, “The Ectopic Stroll” off of their amazing new album Coma Ecliptic. They proved that this song can fit in perfectly well alongside anything from their early work. Between the Buried and Me is a force to be reckoned with, and I suggest you find the time to do so. Where Between the Buried and Me seem to represent emotional vulnerability, August Burns Red represents emotional intensity. 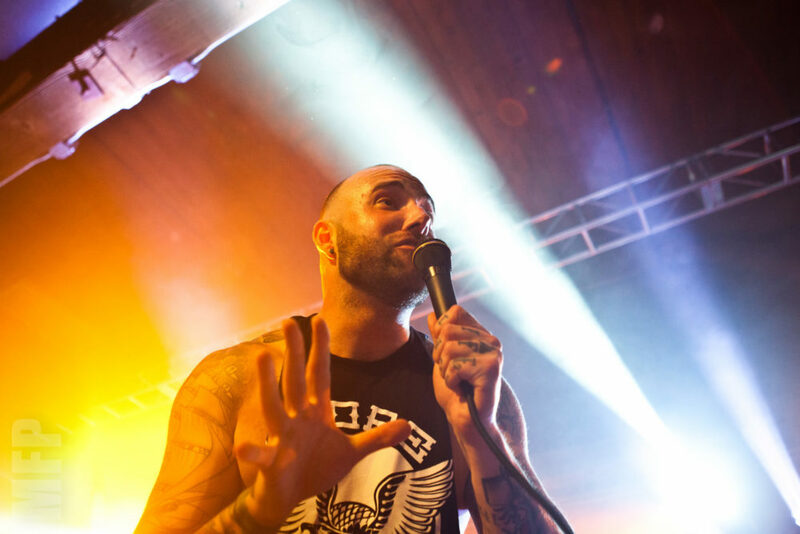 Where Tommy Giles hangs at the back of the stage, occasionally leaving his keyboard to come up front, Jake Luhrs lives at the front of the stage. He’s an imposing force, whose one goal is to get every single person in the building moving and into what his band is doing. Going into the evening I wasn’t familiar with the band’s music, and after having watched them play I can see why they have such a large fan base. Their live shows are pure energy with a foundation of camaraderie. Jake built on this sense of togetherness when he mentioned having been to a Seahawks game three years ago and losing his voice because he got caught up in chaos that is the 12th Man. Before he could finish his thought, Seahawks chants were filling the room. August Burns Red is pure energy and they are damn good at what they do. Whether someone came for August Burns Red or for Between the Buried and Me I think both bands impressed anyone who came exclusively for the other. It was a great evening of music and it all ended early at 10, which allowed me to home by 10:30, which was nice.